The Louisville Leopards Boys Varsity Basketball team used a 20-0 run before halftime to propel them to a 71-38 throttling of the visiting Austintown Fitch Falcons in the home opener Friday Night at Louisville High School. With the victory, Louisville is now an even 2-2 on the season. Senior Post Spencer Hall scored a game-high 20 points all in the first three quarters of action to lead the Leopards. Scotty Gronow also hit 3 of Louisville’s 8 three-pointers to finish with 11. Cam King also scored double digits with 10 and Jimmy Wright added 9. Trailing 19-15 with 6:37 remaining in the second quarter, the Leopards strung together a 20-0 run to close the half and took a commanding 35-19 lead into the locker room. Louisville’s defense held Fitch to only a single field goal over a span of 11:31 as part of a 30-2 run spanning all the way until the Falcons Lorenzo Russo scored on a lay-in with 3:06 left in the third quarter. The rout was on and the Leopards outscored the opposition 42-19 in the second half to earn them a convincing 33 point victory. Austintown Fitch was led by Israel Jsuino who scored a team-high 9 points. Kris Brown also dropped in 7 for the Falcons. Louisville has now defeated Fitch in each of the past four seasons. UP NEXT: The Leopards will next challenge the Walsh Jesuit Warriors on Saturday, December 8 in the Greynolds Classic. Game time is set for 12:45 PM from Barberton High School. FALCONS: Jusino 3 2-3 9, Brown 2 2-2 7, Jaros 1 2-2 4, Leskovac 2 0-0 4, Russo 2 0-1 4, Simons 1 1-2 3, Vernon 0 3-4 3, Talley 0 2-2 2, Woodberry 1 0-0 2, Bandy 0 0-2 0. TOTAL 12 12-18 38. LEOPARDS: Hall 6 8-8 20, Gronow 3 2-4 11, King 3 2-2 10, Wright 3 2-3 9, Pukys 2 1-2 6, Jones 1 2-3 4, Mathie 2 0-2 4, Hoffman 1 0-0 3, Chambers 1 0-0 2, Staley 1 0-0 2. TOTAL 23 17-24 71. Dakota Hoffman scorched the nets for a game-high 29 points as the Leopards JV rallied to beat the visiting Falcons 59-56 in overtime. Kurt Haren also reached double figures with 10 and JT Popick added 5. Louisville trailed by as many as 14 in the second quarter and Fitch still led 30-18 with 6:37 left in the third quarter. The Leopards closed the margin with a 22-10 run and Popick tied the game at 40-40 with a three-pointer off a baseline inbound pass with 4:09 left in the game. Haren hit a pair of free throws a few possessions later to give Louisville their first lead of the game. On the Leopards next trip down Hoffman threw a sick no look pass to his teammate on the left wing. The ensuing three-point attempt missed, but Hoffman stormed in for the putback to make it 44-41 Louisville with under two minutes left. The Leopards continued to extend their advantage when Hoffman fired a half court pass to Haren who laid it in to make it 46-42. Hoffman snagged the rebound on the other end then hit a pair of clutch free throws to give LHS a 48-42 lead with a minute left to play. Devin Chaney hit a three-ball off a bank for the Falcons to cut the lead to 48-45 and then helped force a steal and score by Tyrese Bandy to trim the deficit to 48-47. Louisville split their next four free throw attempts to take a 50-47 lead with 11.8 seconds remaining. After a timeout, the Falcons setup to tie the contest. Their first three pointer missed from the right corner. Austintown’s Allison Edwards pulled down the rebound, stepped back at the top of the arch, and fired home a game-tying triple to send the game into overtime at 50-50. In overtime, Fitch took early leads of 52-50 and 54-52. 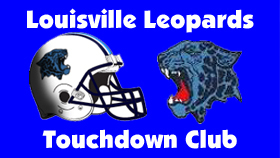 Haren scored the Leopards only field goal in the period to tie the game at 54-54. Hoffman did the rest in hitting 7 of 8 free throw attempts from the line in the extra period. This included hitting a pair with 2.8 seconds left to put Louisville up 59-56. The Falcons final prayer was blocked by the LHS rafters and the improbable LHS come back was completed. FALCONS: Chaney 6 1-2 15, Edwards 4 2-2 12, Keller 2 2-2 6, Remish 3 0-1 6, Wilks 2 2-4 6, Bandy 2 0-1 4, Russo 1 0-0 3, Carr 1 0-0 2, Leskovac 1 0-0 2. TOTAL 22 7-12 56. LEOPARDS: Hoffman 7 13-16 29, Haren 4 2-3 10, Popick 2 0-0 5, Adelman 2 0-0 4, Croxton 1 2-4 4, Staley 1 0-2 3, Johnson 1 0-3 2, Pickens 1 0-0 2. TOTAL 19 17-28 59.